If you’re like us and love your garden, you want to give it the best. 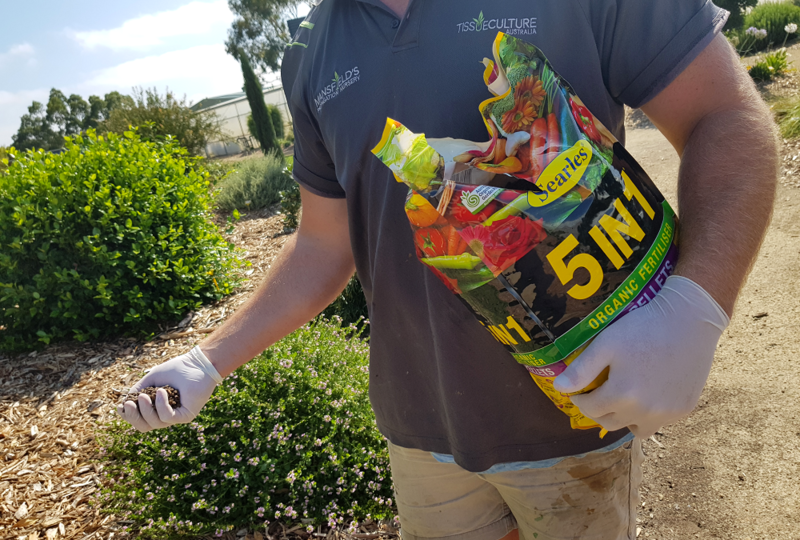 Our favourite organic pellet fertiliser for general use is 5in1 from Searles. Here at Austraflora, surrounding our greenhouses are beautiful display beds with plenty of established plants growing. These are very important for breeder and development trials, propagation cutting collection, photography for our labels and website, and staff/customer outdoor enjoyment. Lots of our plants are Austraflora natives, but we also have other plants for our propagation nursery. 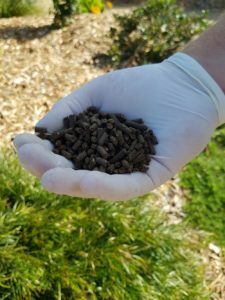 An organic pellet fertiliser is ideal for us as it’s quick and easy to use, lasts a long time, and is safe for the environment. 5in1 comes in generous bag sizes of 2.5kg, 5kg & 15kg. You just grab handfuls and throw it on, taking care not to leave it on the foliage. Always wear gloves to protect your hands. A quick watering in will enable the pellets to begin breaking down, and wash off any leaves. It contains everything the plants need to grow and thrive – a full range of major nutrients, trace elements and minerals. It’s an advanced premium blend with over 10 major ingredients, and completely organic. It also has the bonus of adding long life humus to build up to the soil; This will encourage healthy microbial and earthworm activity. We were able to use it on lots of our shrubs and trees, as well as our lawn areas. We did have to take care avoiding our native plants with this particular fertiliser, as the P levels didn’t suit. We’ll have to use a native feriliser such as Searles Native Organic Kicklalong. You can also use 5in1 for flowers, veggies and fruit trees. Our labels are going to look amazing with the flowers produced from our organically fertilised plants, and our propagation plant cuttings are going to be so strong and healthy! Thanks for Searles for such a fantastic product!